We have a lot of inquiries from the store owners who are due different reasons unsatisfied with their existing developers. Some of them have a Magento store for over a year and they desperately need to upgrade. 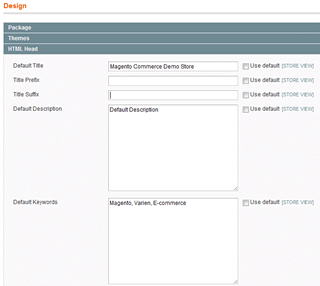 Most standard cases we have recently are the upgrades from Magento 1.2 to latest version and in such cases installations are usually over 1 or 2 years old. This article is not about developer oversights, but those little things that matter. 1. Why didn’t you change default Magento favicon? I constantly get surprised when I see how many online stores in production use default Magento favicon. In some cases those stores have some great designs where a lot of effort was placed into. Why those designers didn’t spend 5 more minutes to create a custom favicon remains a mystery. This one is also very common. Someone spends a huge effort to finalize a store and launch it and forgets to set up some essential SEO preferences. GO to the administration to System> Configuration> Generaeel> Design> HTML Head interface and play with those values a little. It is never good to leave default ones. Those values are usually visible on the pages that do not have custom definitions for meta title, description and keywords. Usual example is shopping cart, checkout, advanced search etc. In some cases they do not make a lot of impact on traffic or search results, but the surely not look good. And the updating those takes only few minutes. 3. You want to have maximum sales, but you don’t know who visits your site? This one is classic. Potential customer calls looking for Magento upgrade. After few minutes of finding out why his current developers can not do the job, I usually ask for some info about his website traffic and sales. In my opinion, every store owner needs to know his website traffic info. So, add that Google Analytics code and analyse the data you get. Why do this oversights happen? I have a feeling that the reason is simple. If the client does not notice, developer will not do it. Tomislav is a founder and CEO at Inchoo. Enjoys traveling - especially quick getaways, traditional cuisine (from most cultures), good wine and strong rakija. There has been an error processing your request. How can i set default keyword for particular category? My stomach turns when I see a Magento site with the default favicon. I’ve actually heard of one company whose client requested that they leave the default favicon, as they thought it would help the site’s visitors establish trust in their site. Hilarious video. Thanks for posting! You can go overnight from black to silver hair.